FALL 2018 at the Alma del Pacifico Beach Hotel & Spa located beachfront along beautiful Playa Esterillos Este in Costa Rica! Bid Per Room Per Night and Stay Four (4) Nights! at Alma del Pacifico Beach Hotel & Spa in Costa Rica! * Not Valid for Stay over Thanksgiving Holidays! Alma Del Pacifico features twenty free-standing, high end, boutique villas each with its own unique artistic and architectural design. 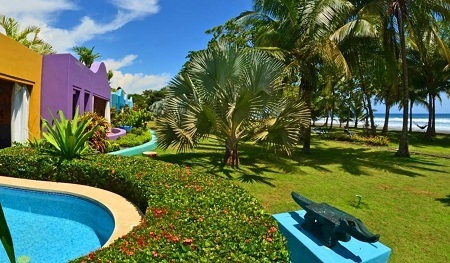 Each villa is comprised of one-of-a-kind art flank that encapsulates the Soul of Costa Rica. Recognized in the Trip Advisor Hall of Fame, our hotel is consistently rated in the top tier of Luxury Destination Hotels in Central and South America. 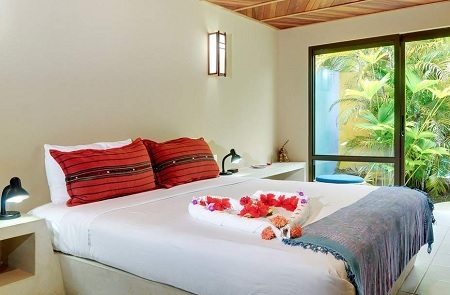 Ideally situated on Playa Esterillos Este between Jaco and Manuel Antonio National Park near Quepos, Alma Del Pacifico Beach Hotel & Spa offers guests a wide variety of Costa Rican vacation activities. Walk or jog along an expansive stretch of shell-strewn beachfront or simply relax while basking in the sun on a chaise lounge or hammock. Wax up your board and hang-ten or take in the sight of dramatic waves crashing along the beach on one of Costa Rica's most famous surfing beaches. Offer is based on single or double occupancy in a Garden Bungalow. Each of our high-end boutique bungalows - uniquely designed by a world-renowned artist - offer you a romantic escape in the most beautiful beach in the world. Located next to our two luxurious swimming pools, each of our spacious, free-standing Bungalows features an outdoor terrace in a private enclosed garden. Many include an outdoor tropical shower. Accommodations include one king bed, and a built-in day bed with over 500 sq. ft. of space. Stay a 4 nights as desired and based on availability. Bid Price is Per Night.